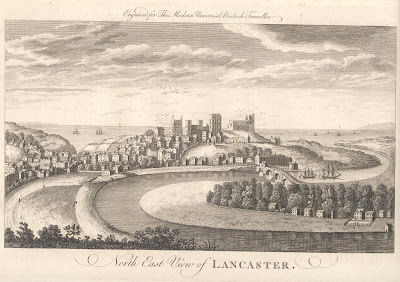 Lancaster’s Castle has dominated the city’s sky line for the last 916 years, with the Romans occupying its site for hundreds of years before this building was ever erected. There is evidence of probably two Roman forts below the castle walls and buildings, with surviving remains of their earlier occupation to found throughout the city. Above. Sketch of Lancaster Castle, probably late 1600s or early 1700s. 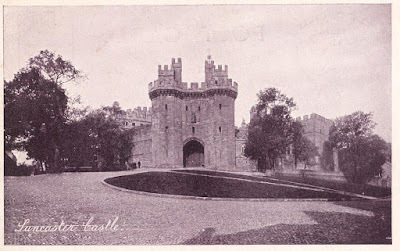 The castle as we see it today, consists of the 12th century keep, the late 14th early 15th century gatehouse, the early 14th century Well (Witches) Tower, the late 18th century Gaoler’s house, the late 18th century Male Felon’s prison, the late 18th century Shire Hall, Adrian’s Tower from the early 13th century, the late 18th century Debtor’s Wing and the late 18th century Female Felon’s prison. Click on the plan for a full page view. A good portion of the Norman and medieval parts of the castle survive. 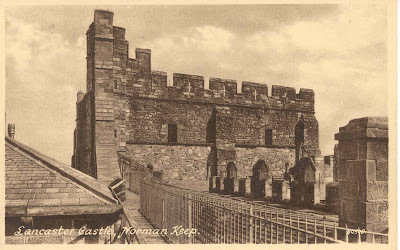 The Keep, built sometime around 1150, is the oldest part of the castle, and stands four storeys tall (20 metres in total) over walls some 3 metres thick. 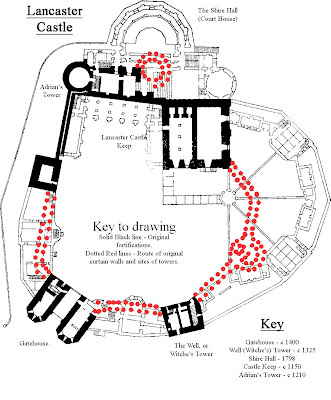 There seems to be a distinct lack of documentary evidence of the exact date the keep was built, who built it and how much it cost. A view of the castle from the Ashton Memorial. 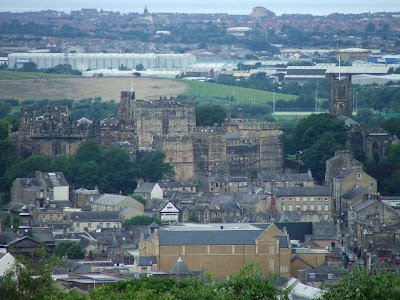 Lancaster Priory can just be seen to the right. 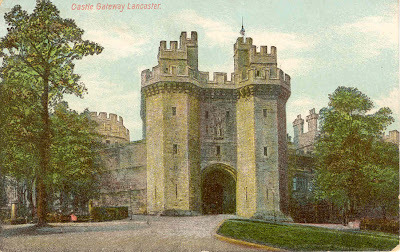 The gatehouse is thought to have been built around 1400 at the command of Henry IV after the original gatehouse and probably some of the castle was damaged during the Scottish invasion of 1389. 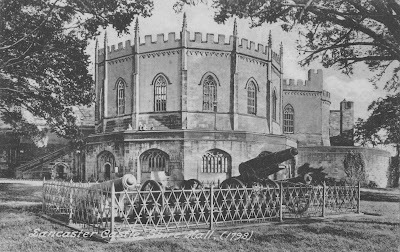 The new gatehouse was built with two elongated polygonal fronted towers measuring some 8 metres in width. Both of the towers are around 20 metres in height, equipped with a massive portcullis and two doors. The battlements are built out over the corbels of the roof and would have enabled the defenders to easily target attackers as they attempted to breach the castle walls and the gatehouse door. The Well or Witche’s Tower was probably built around 1325, although it’s likely that what we see today is a rebuild of a much earlier structure, possibly dating from around 1190….a few years after the keep was erected. 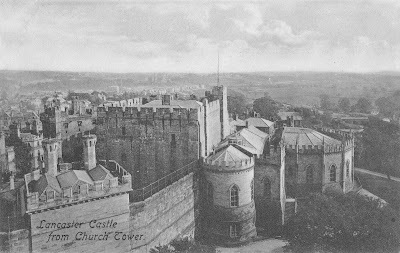 It gained its name “The Witche’s Tower” after the Pendle Witches were imprisoned here before their trials and eventual executions. 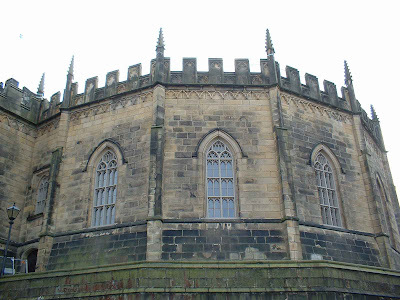 The tower measures around 12 by 10 metres, and rises to four storeys. 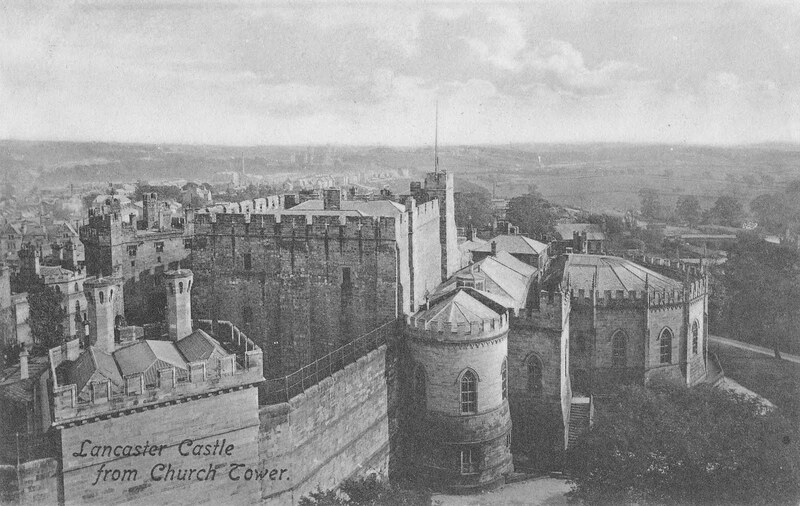 The other name, the Well tower comes from the fact that the tower’s basement contained two of the castle’s wells. Adrian's Tower. Refaced and hence hiding its medieval origin. Adrian’s Tower was built around 1210, and measures about 10 metres. Apparently the name reflects local tradition that the tower was originally built by the Roman Emperor Hadrian…obviously dropping the H along the way!! Although the original medieval masonry can still be seen inside the tower, its age is somewhat hidden by the refaced stonework, probably added towards the end of the 18th century. The Shire Hall sits outside of the original foot print of the castle (see the map above) This addition to the castle was built between 1796 and 1798, and housed the courts. It is of a non-defensible build. Much, if not all of the original curtain wall has been replaced, but the line of the original wall can be seen on the plan above. From this, it’s easy to see that the original castle layout was significantly smaller, and incorporated a number of towers that were demolished at different times and built over. 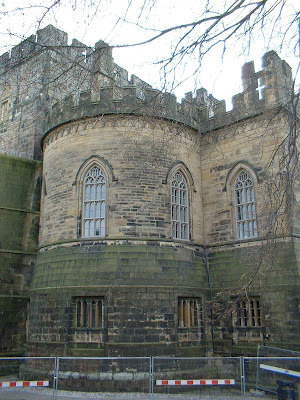 Although the keep unfortunately is not open to the public (it’s an operational prison) the courts and the accompanying holding cells can be visited, although you’re not able to take any photos within the castle walls. Fortunately though, the castle is easy to photograph from the outside, with great views of the city to be had from the Ashton Memorial (as seen here). 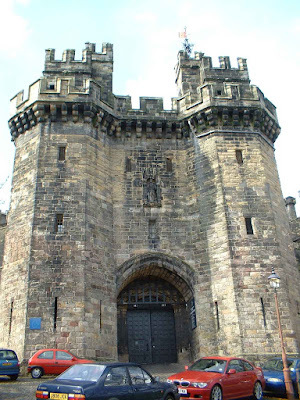 As of 2011, plans are afoot for the closure of HMP Lancaster Castle. Every indication is that Lancaster City Council and the Duchy of Lancaster would like the medieval castle to become a tourist destination when the prison is officially closed. This would mean that at last, tourists would be able to visit the interior of this well maintained medieval fortress.